In a letter he wrote in 1888, Vincent van Gogh (1853-1890) mentioned he had been to Montmajour, in Provence, France, more than 50 times to admire the view. That same year, he painted the landscape at dusk: hilly, with forests, wheat fields, and the ruins of a Benedictine abbey. The painting was owned by his brother until Theo's widow sold it to a Paris art dealer in 1901. It was purchased by a Norwegian collector in 1908, but shortly thereafter was deemed a fake. It lived in the collector's attic until he died in 1970. The current anonymous owners have just met with success on their second attempt to authenticate the painting. They have not indicated whether they intend to keep it or to auction it, though it is of course worth tens of millions of dollars. 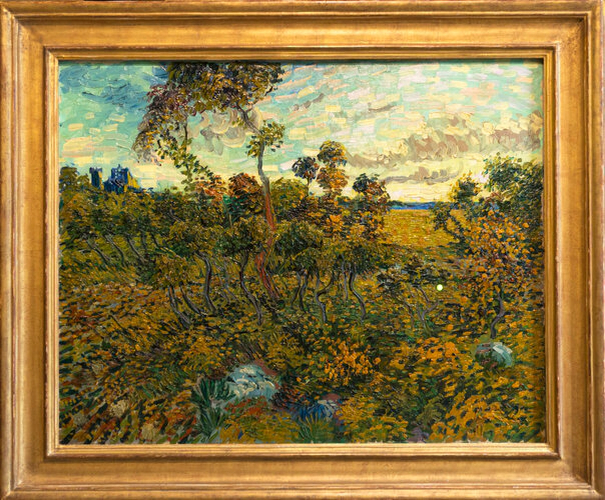 In the opinion of art historian Fred Leeman, former chief curator of the Van Gogh Museum, “Sunset at Montmajour" (IMAGE ABOVE) contributes to an alternative understanding of the artist. “We have the impression of van Gogh as a very modern painter, but here he’s working in the tradition of 19th-century landscape painting."